Eight teams will spar off over these two days in hopes of keeping their Super Bowl dreams alive. Upsets are always possible, if not probable, during Wild Card Weekend, especially over the last few years. Once a few names have been weeded out of the NFL playoffs brackets through the Wild Card portion, four teams will be left for the AFC and four teams for the NFC. The two leaders for both conferences will see action, having a bye week through the Wild Card games. 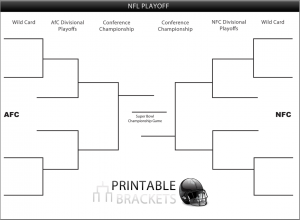 On January 20th, the NFL playoffs brackets will have narrowed down to a total of four teams, two per division. The winners of each of the four divisional playoff games will compete for the opportunity to win their conference and play on the grandest stage of them all. By this point, the NFL playoffs brackets have all but fallen away and only two teams are left to compete for the crown of world champions. This year’s Super Bowl will take place in New Orleans, Louisiana. All in all, there are many steps throughout the NFL playoff brackets that can take a shoe-in team and replace it with a Cinderella story no one could have anticipated.